Dorothy “Dottie” C. (nee Forte) Rutledge, 93, passed away on Wednesday, November 21, 2018 at Columbus Hospital LTACH in Newark, NJ. She was born in Newark, resided in the Ironbound until moving to Harrison in 1972, and then moved back to the Ironbound in 2010. Dottie was a Key Punch Operator for Good Deal Co. in Elizabeth for many years. She was a lifelong parishioner of Our Lady of Mount Carmel Church in Newark, where she was a member of the Mt. Carmel Society. 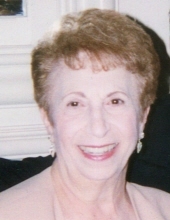 She served as President of the North Newark Chapter of Deborah Hospital, was a member of both Senior Citizen Clubs of the Ironbound, Clifford St./Rome St. as well as the Independence Park Friday Club where she served as Secretary. Wife of the late Raymond C. Rutledge; devoted and loving mother of Carmine Rutledge and his wife MaryAnn, John Rutledge and his wife Diana and Raymond Rutledge; sister of the late Angelina, Nicholas, Anna, Mary, Madeline, Carmine, Ralph and Edith; dear grandmother of Maria, Kathleen, Diana, John, Raymond and Michael; cherished great-grandmother of Danielle, Carmine, Michael, Adriana, Daniel, Angelina and Patrick. The Funeral for Dottie will be held on Monday, November 26, 2018 at 9:30 am the Buyus Funeral Home 426 Lafayette St.at Wilson Ave., Newark 07105. Thence to Our Lady of Mount Carmel Church, Newark, where at 10:30 am the Funeral Mass will be offered. Interment to follow at Holy Cross Cemetery, North Arlington, NJ. Relatives and friends are welcome to attend. Visitation for Dottie will be on Sunday, November 25, 2018 from 1 - 5 pm. To send flowers or a remembrance gift to the family of Dorothy "Dottie" Rutledge, please visit our Tribute Store. "Email Address" would like to share the life celebration of Dorothy "Dottie" Rutledge. Click on the "link" to go to share a favorite memory or leave a condolence message for the family.